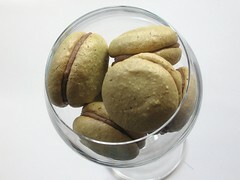 Chestnut and Green Tea Macarons - Do You Know The Muffin Man? Recipe adapted from A La Cuisine! Notes: I had some chestnut pastry cream and egg whites left from Saturday's cake, so I tried my hand at macarons again using Clement's basic recipe. 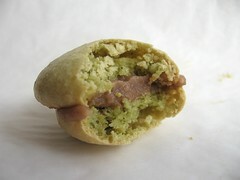 I added some green tea powder to the macaron batter, about 2 tsp. This attempt was pretty disappointing, as the first batch I made had cracked tops and undercooked centres which I threw out. I used a large sheet pan that was too big for my oven and the air couldn't circulate causing the thermostat to keep the element on for too long. The second batch I made this morning was undermixed, which meant the cookies didn't spread and were too thick. This resulted in cracked tops, no feet, and slightly undercooked insides. The cookies taste good, but the flavours were too subtle even for me. More matcha in the macarons next time, and maybe sweetened chestnut purée right from the can for the filling. Update: The pastry cream was too wet for the macarons. After a day or so in the fridge, the cookies started to absorb the moisture and break down.